Red-brown exfoliating bark and a graceful upright rounded form make this a real find. Yellow green leaves turn a rich gold in autumn. Hardy to -30F (-34.4C); height: 75ft. Serrated oval leaves and tan bark. Muliple trunks. Bright gold fall color. Hardy to -30F (-34.4C); height: 70ft. This variety is rarely found in the US as it is a native of the Kurile Islands. The leaves are larger and more lustrous in color than most of the birches. 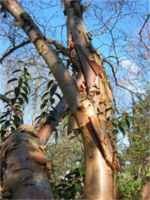 Bark is light grey to white and peels. Very bright yellow fall coloring. A graceful specimen or light shade tree. Hardy to -20F (-28.8C); height: 75ft.